Popular “rock artist” Linda Kranz returns to remind us that those we love are always with us. During the course of each day, something sparks a thought or memory, and a loved one comes to mind. Perhaps it’s a sound, a fragrance, or something that catches our eye; when this happens we can’t help but pause for a moment and smile. So give this book to the special loved ones in your life, and they will share with you all the times they think to themselves how much they love you, when . 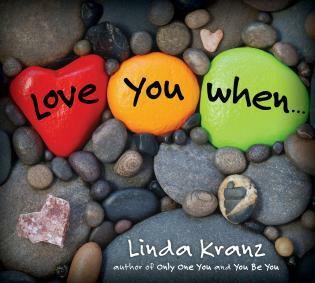 . .
Linda Kranz, winner of the IRA Children’s Choices Award, is the author of eight journals and a craft book, as well as the bestselling Only One You and You Be You. A self-taught artist who painted on canvas until the day she found a smooth river rock, Linda lives with her husband in Flagstaff, Arizona. Together they enjoy discovering new landscapes in and around the Southwest and returning to their longtime favorite places, again and again. For a complete list of her titles, visit her website at www.lindakranz.com. My favorite rocks are back, this time providing colorful and evocative assurances that each of us is loved—always. With Love You When . . ., Linda Kranz creates an engaging testament to the timelessness of love, once again aided by her frisky and ingenious buddies, the boldly painted rocks who so artfully share her stories. Kranz’s gentle touch with word and brush belies the exquisite power of her message: I love you always. This may be a children’s book, but children should make sure their adults have one, too! I was thrilled to read [the] beautiful book Love You When. . . . The images, the message, the rocks! What an amazing book! . . . Once again you have inspired me and made my world a better place. Thanks for being you!
. . . Beautifully illustrated with a motif of rocks and stones, this might be a more personal book as a gift. Teachers will enjoy the writing pattern templates on the author’s website. This sweet book is the perfect bedtime or anytime story to share with your little ones. No games are available for this title currently. Muddy Boots is an imprint of Globe Pequot, the trade division of Rowman & Littlefield. Marrying Globe’s unique brand of category focus and expertise with our love of all things outdoors, Muddy Boots is home to backlist gems from best-selling authors as well as new work from established and emerging authors and illustrators. Titles include non-fiction for babies through pre-teens, as well as activity books and illustrated story books.